There’s been a lot of buzz among Facebook investors after they announced lackluster results for their first quarter as a public company. Shares sank 10% in after hours trading signaling that the public is getting less patient after the social network giant posted net losses of $157 million. Zynga plunged 40% after announcing results a day earlier, and after Facebook’s quarterly results were announced, the social gaming company was hit even more. Consumers are fickle. Building a business based on consumer behavior is risky, the main reason consumer companies can grow quickly, but then experience unpredictable performance. We looked at b2c and b2b companies after going public, and the data supports this view (our analysis included all tech IPO since 2004 who had one year or more of aftermarket performance by 12/31/11). SaaS companies experience the highest consistency after going public, while other business models are less predictable. 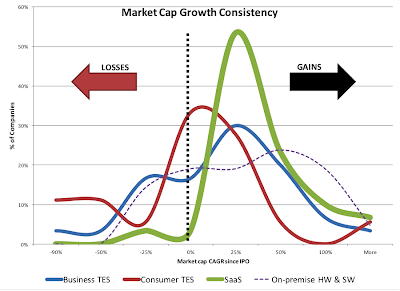 The distribution of growth for each sector is shown below. Less than 10% of SaaS companies have seen declines since their IPO, while 67% of Consumer Internet companies are valued below their IPO price.